Swati Dhir is a Fellow of Indian Institute of Management (IIM) Lucknow and completed the Fellow Program in Management (FPM) in OB/HRM area in 2014. She is currently working as Assistant Professor in OB/HRM area at International Institute of Management New Delhi. Prior to this, she has worked as Assistant Professor at IIM Ranchi for 1.5 years. She is a B.Tech Textile Technology from UPTTI, Kanpur affiliated by Uttar Pradesh Technical University. 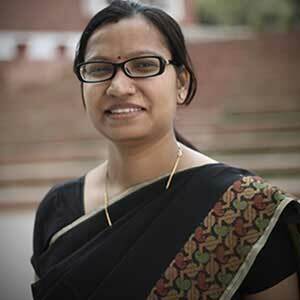 She has also worked as Assistant Manager in Research and Development department at Abhishek Industries (Trident Group). She has published her research work in many National and International Journals (Scopus and ABDC indexed) and attended various National and international conferences. At the Post Graduate the courses taught includes Human Resource Management, Organization Structure and Design, Recruitment and Selection, Talent Management, International HRM and Psychometric Testing. Her teaching interest also includes Organization Structure and Design, International Human Resource Management, HR analytics and Research Methodology. Her research interests include Diversity in Organizations, Work Related Attitudes, Employee Engagement, Work Role Performance and Employee Loyalty. Her research contribution is also evident in the Editorial Review Board of “Amity Journal of Training & Development "- An International, Biannual, Refereed Journal of Training & Development. She has also been reviewer for various referred International journals and conferences like AOM and IHRM. She can potentially supervise PhD students and contribute towards Doctoral level courses on Advanced Research Methodology. She had contributed in various academic activities, being a member of PGDHRM program committee, admission committee and doctoral program committees at IIM Ranchi. Currently, she is the member of ACC (Academic Curriculum Committee) for PGSHRM program at IMI Delhi. She has guided 3 students for courses of independent studies in last one year at Post graduate level and currently guiding one research scholar at FPM Level. On the personal front, she is a happy, responsible and creative person with experience in voluntary social work like community teaching and guidance to students. Dhir S. & Dhir S. (2017), Adoption of open-source software versus proprietary software: An exploratory study. Strategic Change, 26 (4), 363-371. Dhir, S. & Dhir S. (2017) COMFED: The New Challenges of Diversification with teaching notes published in Emerald Emerging Markets Case Studies, Vol 7 (2), 1-26. Parameswar, N., Dhir, S., & Dhir, S. (2017). Banking on Innovation, Innovation in Banking at ICICI Bank. Global Business and Organizational Excellence, 36(2), 6-16. Chaurasia S. & Shukla A. (2014). Psychological Capital, LMX, Employee Engagement and Work Role Performance, Industrial Journal of Industrial Relations, Vol. 50 (2). Chaurasia S. & Shukla A. (2012), Linking LMX and Work Role Performance: The influence of Psychological Capital and Employee Engagement, Proceedings of Academy of Business Research International Conference, Biloxi, MS, USA. Chaurasia S. & Shukla A. (2012), The influence of Leader Member Exchange relation Employee Engagement and Work Role Performance, 12th International Human Resource Management Conference, MDI Gurgaon. Chaurasia, S. (2011). Balanced Score Card on Top Performing Indian Firms. Annual Conference of Southern Management Association, Georgia.